Choose the most fragrant-smelling melon you can for this. Peel the skin from the melon quarters and discard the seeds. Cut the melon flesh into chunks and blend in a food processor or blender until smooth and slightly frothy. Pour into a bowl, add the lemon juice and sherry and season to taste. Chill for at least 1 hour, or up to 12 hours. 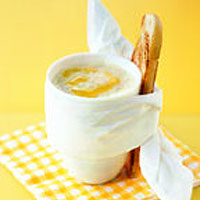 Drizzle the soup with some lemon-flavoured oil and serve with lightly toasted focaccia bread, if desired. When scooping out the melon seeds, hold the melon above a sieve placed over a bowl, and add any juice you catch to the soup. When looking for a melon, choose one with a sweet fragrance, which gives slightly when lightly pressed at one end.